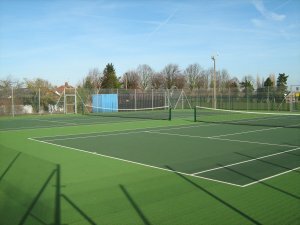 There are 2 Tennis Courts located on Saffron Road Recreation Ground. The nearest point of access being Wharf Road. Ferrers and Rushden Tennis Club meet at these courts on Wednesday evenings and Sunday mornings during the season. These sessions are social tennis but the club also play in tennis leagues, if you would like to play competitive tennis. Further details can be obtained from Steve Roberts on 01933-461028 or 07960 846092. During term time the courts may be in use by the Higham Ferrers Junior School during the school day. At other times the courts can be booked. Hiring can only be by persons over the age of 16 and you will need to either be on the electoral roll or provide ID and proof of address when you hire. Hire costs £5 per hour for each court, £10 weekend use. A £5 refundable deposit is required for the key. To hire - Visit the Town Hall between 0900-1400 Monday to Friday, terms and conditions apply. To enquire about availability fill in the form below. 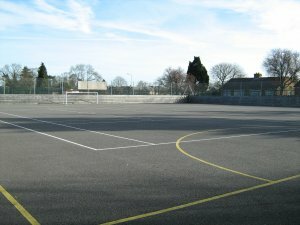 The MUGA is open to free use between 9am and 5pm when there are no bookings. (note in Term Time the facility is used by Higham Ferrers Junuior School. The cost for sole use of the area is £20 per hour.